You and I have a problem. To an ever-increasing extent our digital technologies—especially the mobile devices and smart, Internet-connected things—these technologies are doing our work for us. As I drove recently, the entire 3.5 hour drive was plotting for me by the Google Maps app. Soon my car will drive the route for me. When I arrived at the hotel, the television was already on, inviting me to spend some time on one of 300 channels. I was bewitched by the ease of entertainment, which sought to save me from my presumed boredom. Soon I will be able to watch any movie, television show, or any sports game I want, at any time, through my digital eyeglasses, or my cyber-cornea. You might say: what’s the problem? These are helpful and enjoyable conveniences. And indeed, I must admit, there is much to appreciate about these and other more serious advantages of our digital technology. The problem is that all this functional and fun technology is disabling us spiritually. It is amusing us to ignorance of the gospel, assisting us to weakness in character, connecting us to isolation from other Christians. Our entertainment takes increasing time from serious study and discussion of God’s word; our access to information diminishes our ability and desire to work hard for what is good and true; and our ability to connect superficially at a distance makes it more difficult and less likely to meaningfully communicate and interact with others in society. These critiques of technology are long-standing, represented, for example, in the work of Neil Postman, Jacques Ellul, and Sherry Turkle. My goal is not to rehash these critiques of technological society, nor to persist or to be deterministic in such critique. I wish to ask how we can grow as children and servants of God in such a digital culture. How can we mature so that we know the fullest joy as Christians in this digital life? How can we overcome these problems and have a full hope of heaven in the life to come? And, perhaps most distinctively, how can our digital technology help to increase this true joy and hope? Because I believe that answers to these questions cannot avoid the digital technology that is increasingly the air that we breathe, I think of Christian life needing to be rooted in “iDisciplines,” which is a term I will use for habitual and purposeful uses (and non-uses) of technology. Within a Christian context, these iDisciplines are spiritual exercises modeled upon Biblical texts, and formative of character and conduct that follows Jesus by living faithfully with and through electronic tools and the digital environment in which they participate. As we progress in this conversation, please consider what are the spiritual disciplines you need to be faithful in digital society. How might your devices be the equipment for these Christian exercises? And how does the Bible provide a formative basis for these transformative practices? Knowing God Through Experience: The role of personal testimony in baptismal services among Baptists. A CHARIS lecture by Dr. Anthony R. Cross, Oxford University. Response from Dr. Everett Ferguson, Abilene Christian University. Originally presented October 12, 2015, Chapel on the Hill, Abilene Christian University. The Sacrament of Baptism among the First Baptists. Dr. Anthony R. Cross (Oxford University). With a response by Dr. Doug Foster (Abilene Christian University). Presented as a CHARIS lecture on October 13, 2015. Abilene Christian University. Dr. Royce Money, Chancellor of Abilene Christian University, shares insights regarding the importance of the historical nature of a Christian University. Kent Smith, ACU Missions Coordinator for North America, led a session on the future of “new churches” at the 2014 Stone-Campbell Dialogue. The conference was held at Abilene Christian University in October 2014. After participating in a series of 2014 chapel forums focused on the religious heritage of Abilene Christian University, students at ACU share their reflections on their study of, and background in, the Churches of Christ. In this video ACU Faculty reflect on University Identity and Christian Heritage. Drawing from CHARIS-hosted conversations at Abilene Christian University during 2012-13 about faculty members’ relationship to their religious heritage, three ACU faculty share their reflections about the importance of faith tradition to personal and university identity. This short video was shown at the ACU faculty “presession” at the start of the fall semester 2013. Every family has a story. These stories are usually exchanged upon the knee of a beloved grandparent or told around the dinner table during the holidays. During the past month a patron has been kind enough to invite Special Collections into her own family’s story. We are proud to announce the acquisition of the Ervin Family Papers, which catalog the pioneering adventures of the Ervin family ancestors, Jonas Lafayette and his wife, Mary Hamilton Ervin. 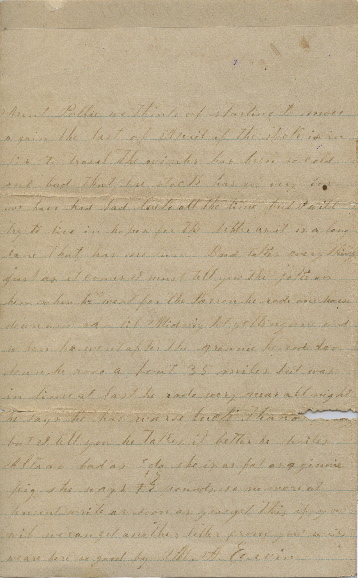 Of special note within this collection is a pair of letters written by Jonas Ervin and Mary Ervin during their first year on the Texas frontier. Both Mary and Jonas discuss the hardships of the frontier; topics range from not being able to afford vittles to suffering from scurvy. It is important to draw attention to the structures of these two letters. When placed side by side you can identify congruent headings and salutations in both letters. It has been my observation that Mary demonstrates a higher level of literacy than her husband, Jonas. 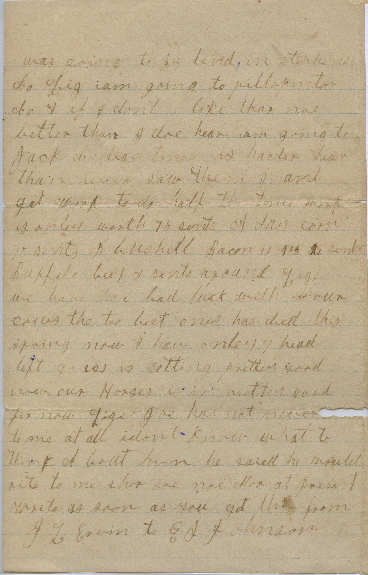 The script of her handwriting is much neater; her grammar and spelling is also up to standard while Jonas’ letter is peppered with spelling and grammar mistakes. It is possible that Jonas asked for Mary’s help in formatting his letter or at least copied her style in order to write a legible letter. As a researcher, it is interesting to notice the differing levels of education between Jonas and Mary. It is obvious that Jonas is barely literate while Mary has gone through some kind of formal instruction. Does it strike you that, as a female on the Texas frontier, Mary would have a higher level of education than her husband, Jonas? These letters serve as excellent windows into what living standards were like in West Texas during the 1870s, as white pioneers from the east began to settle the area. Though the Ervins faced many perils and tribulations they were able to build a legacy upon the dusty, Texan earth and a life for their family; which consisted of thirteen healthy children, all of whom survived into adulthood. What is your family’s story? What obstacles did they face while taming the wild, open spaces of the Texan wilderness? You’ll be surprised by the historical landscapes that lay before you when you examine your own family’s journey. Please share with us your family’s story so that we may all know more about our collective past. 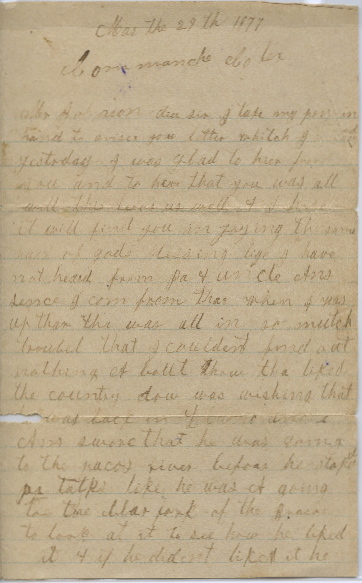 Below are transcriptions of both Jonas’ and Mary’s letters. 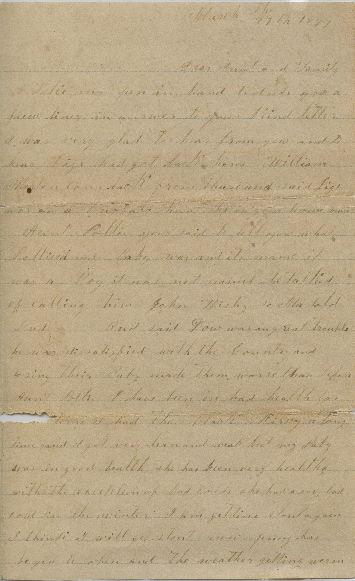 The transcriber has preserved the original grammar and spelling of each author. Some words are unintelligible. If you have any insights into what some of these unrecognizable words might be please comment. Thank you.